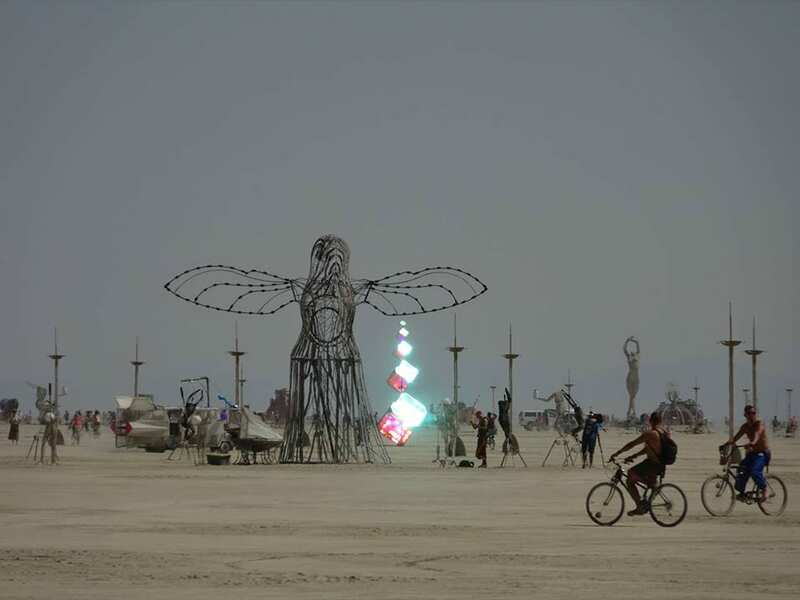 Building art at Burning Man is like a pilgrimage: the suspension of day-to-day life and livelihood to embark upon a journey entailing arduous work, and self-reliance in a harsh environment, to create art that is installed for a mere week is done as a labor of love and dedication. 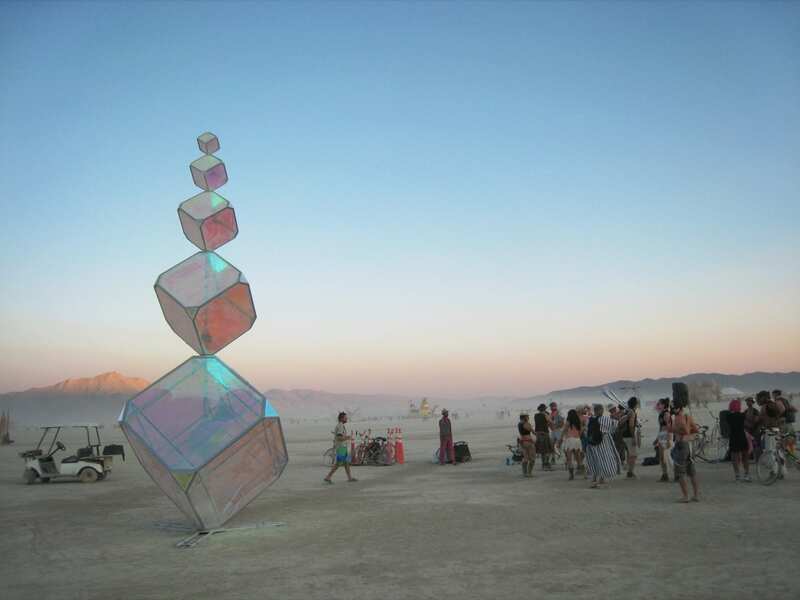 (In)Visible is my third large-scale installation. 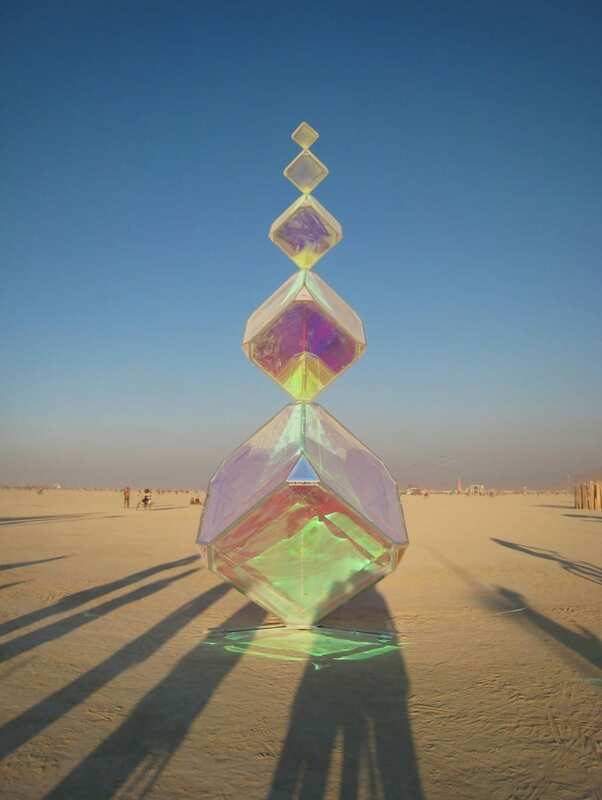 It refers both to the spectrum and the phenomenon of iridescence as visible metaphor for the invisible glow of consciousness and insight/creative spirit. 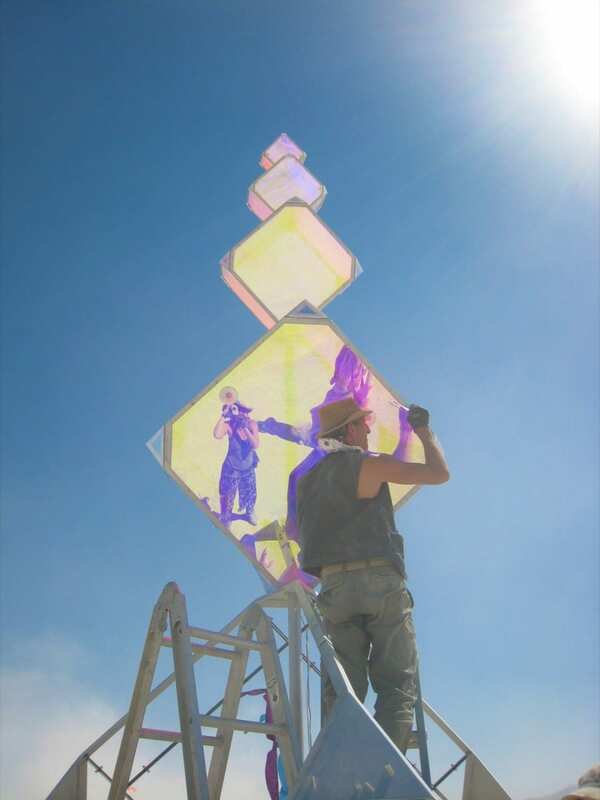 I’ve been creating installations using reflective surfaces and tight geometric forms to refer to that which is fluid and elusive for several years; I am also a painter and illustrator. I’ve been intrigued by iridescence in nature for a long time… tropical beetles, morpho wings, spectral clouds, oil slicks. I realized its appeal comes down to immediacy: the excitement of catching a flash of brilliant color is direct and unfiltered by mind and concept, like the joy of catching sight of the rainbow as a child, or a flash of insight as an adult. 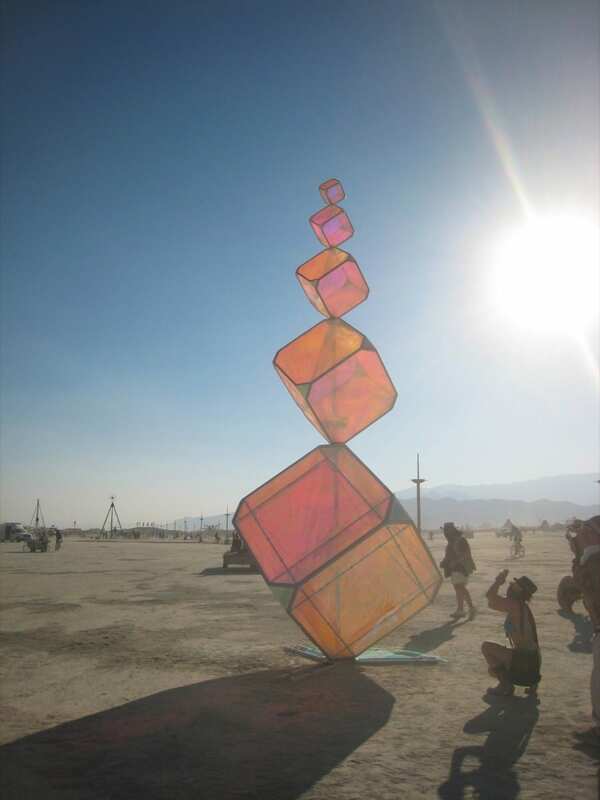 (In)Visible was also inspired by how iridescence actually arises: also known as “constructive interference,” iridescent color forms when two similar light wavelengths combine reflections… generating vivid, flashing color that doesn’t exist as pigment in the surface of the object, but hovers above it. So, it’s analogous to the spark of our own spirit. We need our own finite physical form as the platform for perception, yet what we perceive eludes our grasp and resists containment. 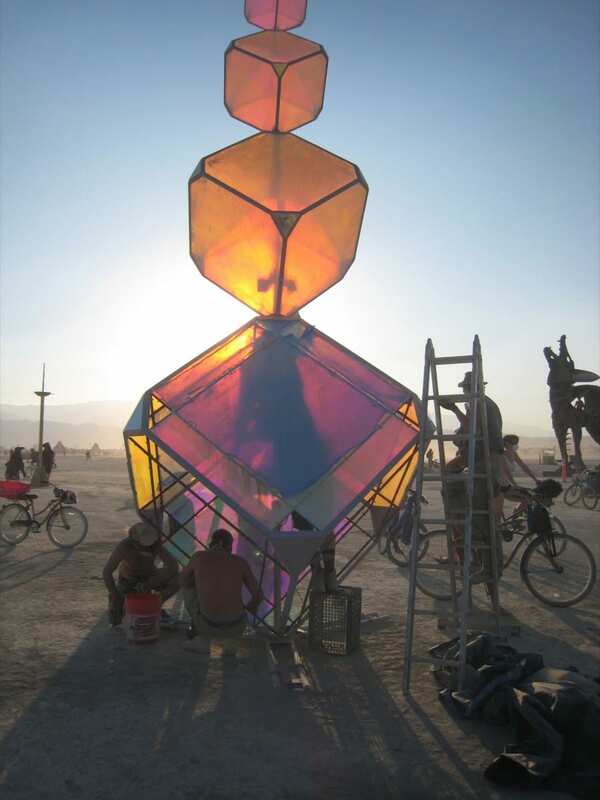 The five faceted cubes of (In)Visible refer to the faceted spine, the first rigid structure of our embodiment and support for the head, the classic seat of our consciousness. 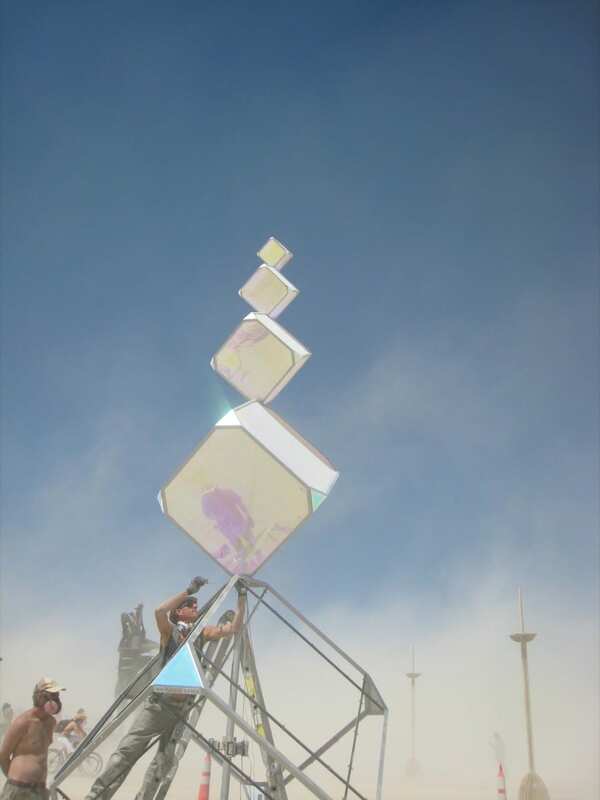 (In)Visible rises as a 20 foot high tower of spectral mirror and steel; its surfaces are highly iridescent, semi-mirrored, transparent acrylic panels. 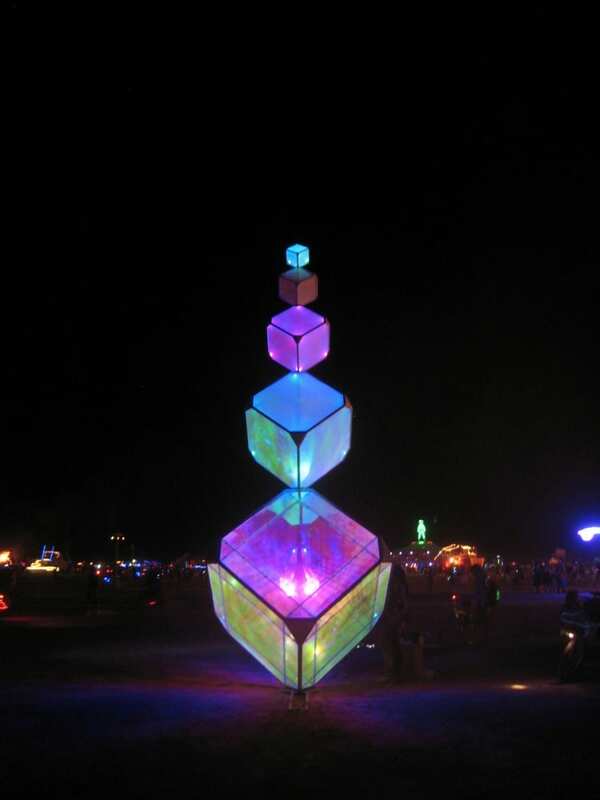 It is a series of five cubes stacked point-to-point in incrementally smaller iterations; the base cube is 8.5’, the smaller cubes measure 5.25’, 3.25’, 2’ and 1.25’ (point to point). Shadows are cast in violet at noon, shifting to red-orange as the sun lowers in the afternoon. 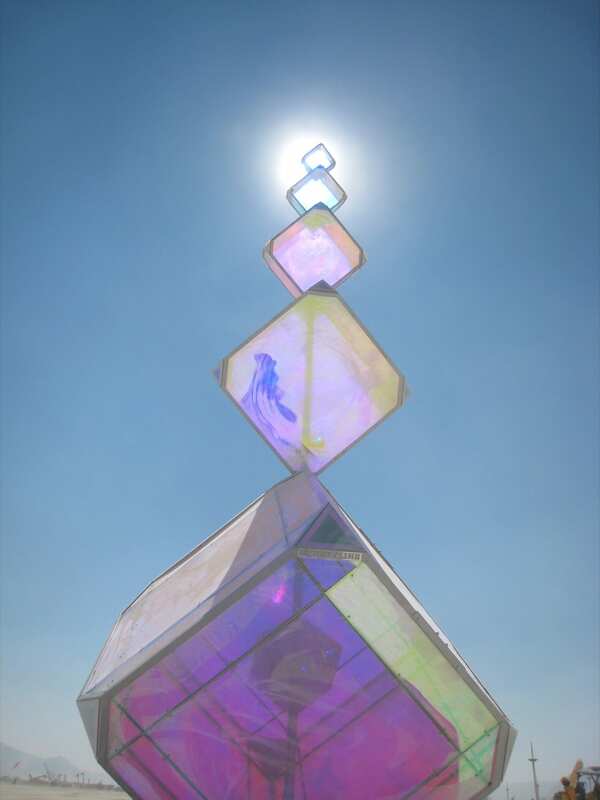 Circling around the pillar of cuboid forms, colors morph across the spectrum and surfaces shift continually between translucent and reflective. 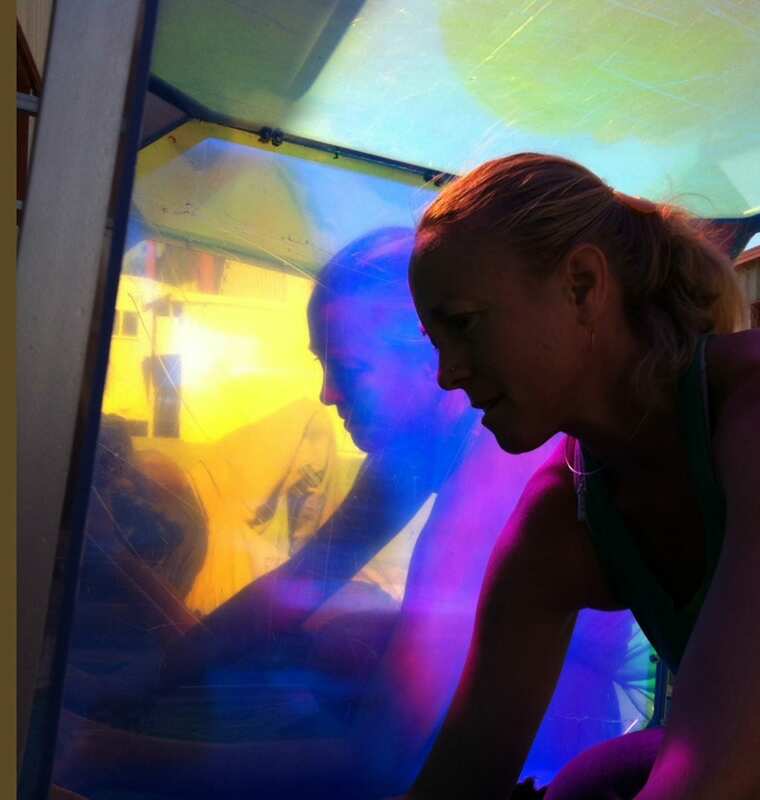 The non-pigmented acrylic sheets reveal the reddish wavelengths of the setting sun. 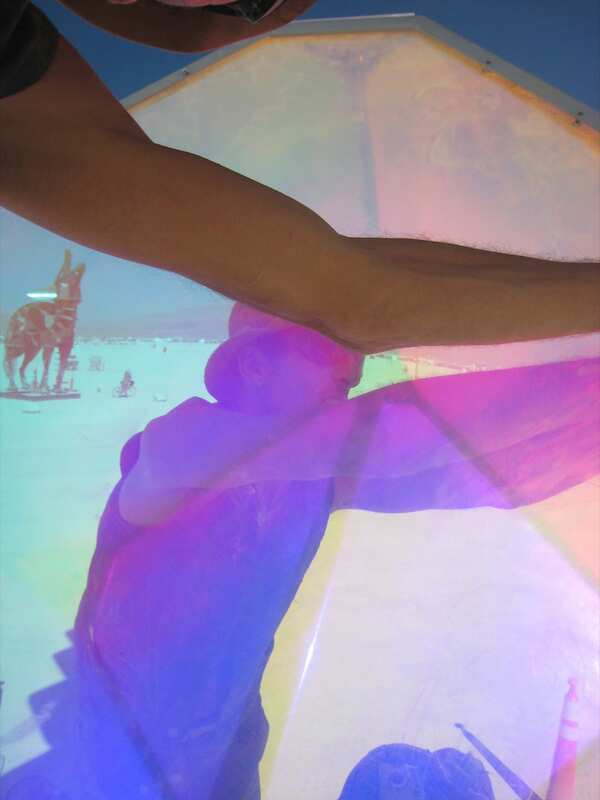 When I conceived of (In)Visible, I envisioned viewers shifting heads and bodies to chase the unpredictable flashes of color, evoking the rainbow to rise from the surface. What begins as a purely visual experience stirs us into kinetic response… This was indeed what happened as people came up to (In)Visible. The brightest reflections hover in the blue-green part of the spectrum. 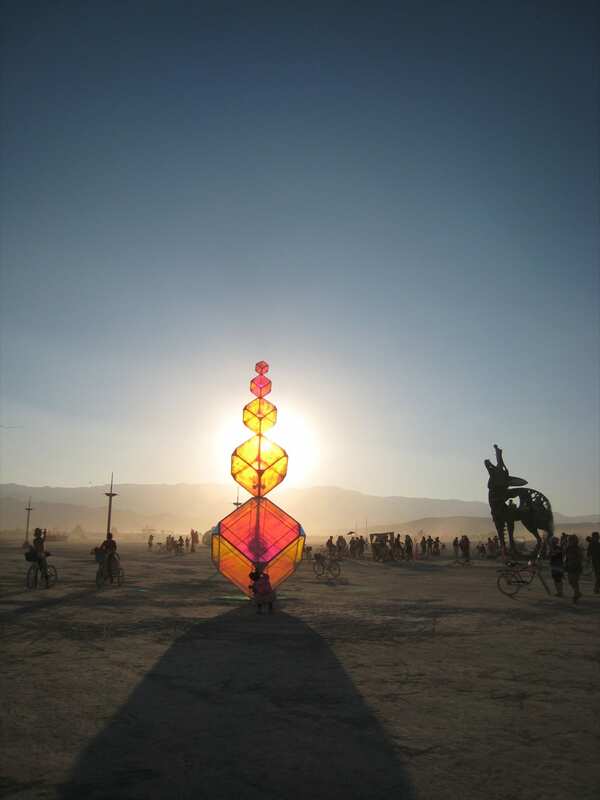 Color, reflection and transparency shift according to the angle of the sun and perspective of the viewer. 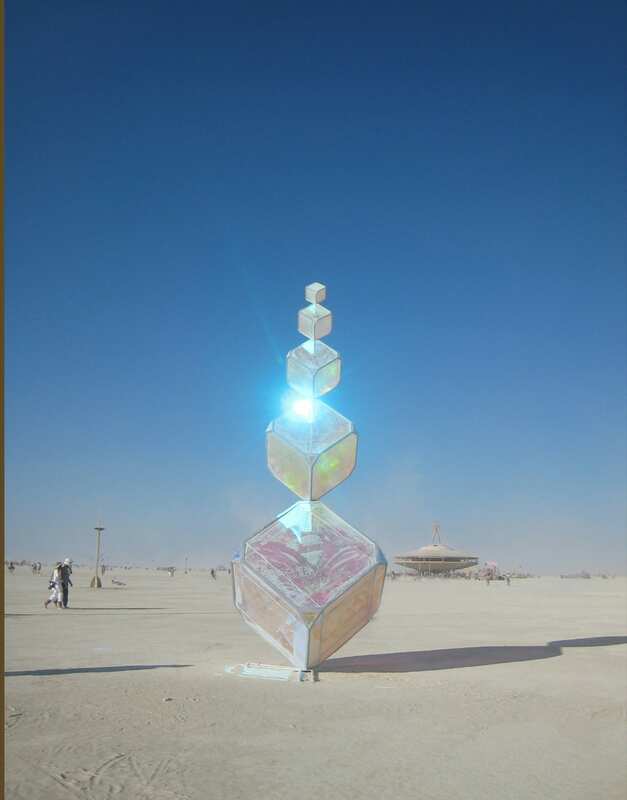 Dust particles suspended in the air capture reflections in sustained view, showing their outward/upward-moving pathways in late morning/early afternoon. 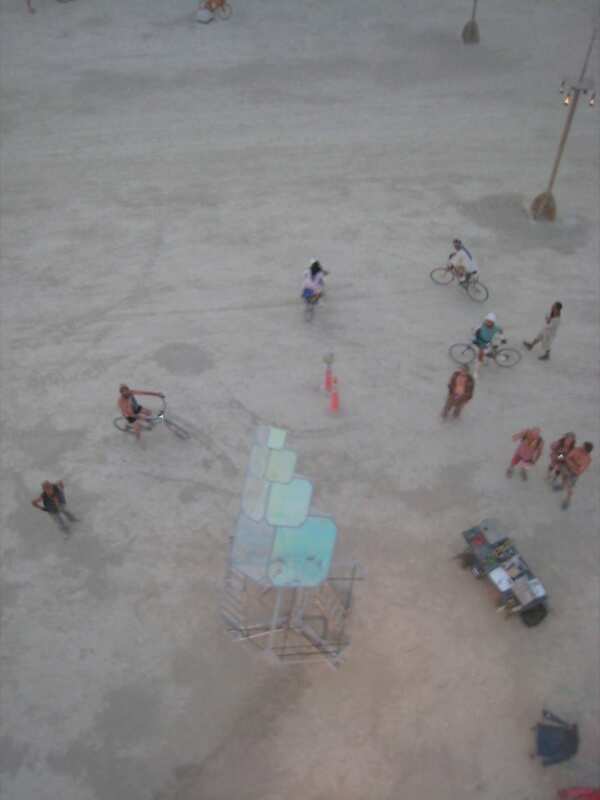 The reflections can be seen at a distance of 1-2 miles. Day 1: A narrow hole has been dug by an augur and the largest cube is mounted onto the central rod that sits 3 ft deep into the ground. Next, we lay down cables and refill the trench that has been to the power source (two marine batteries charged by a solar panel) 35 feet away. The workstation is set up and packed down every day, as only the art is allowed to remain on the open ‘Playa’. 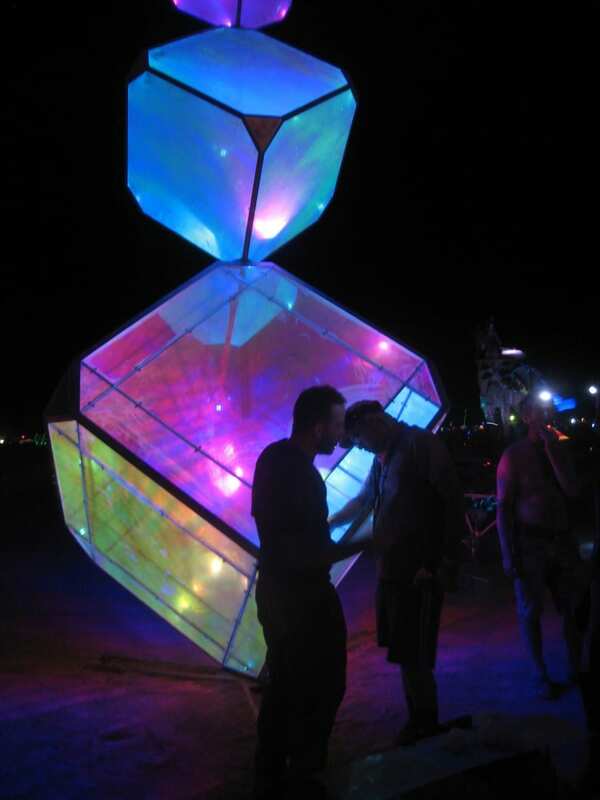 The second largest cube is bolted and wired into the upper stack of three cubes, which are welded as one unit. 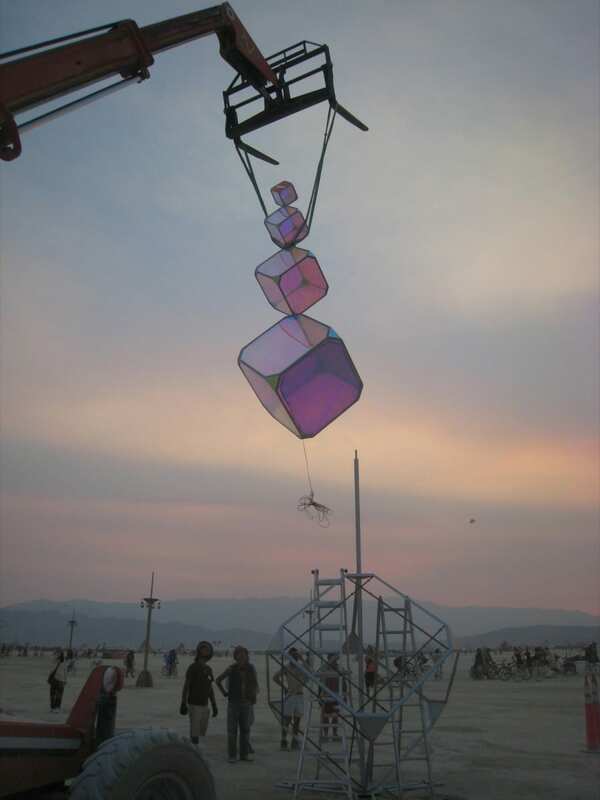 We tie the cubes off with straps and hope for the best as the reach forklift raises the stack aloft. 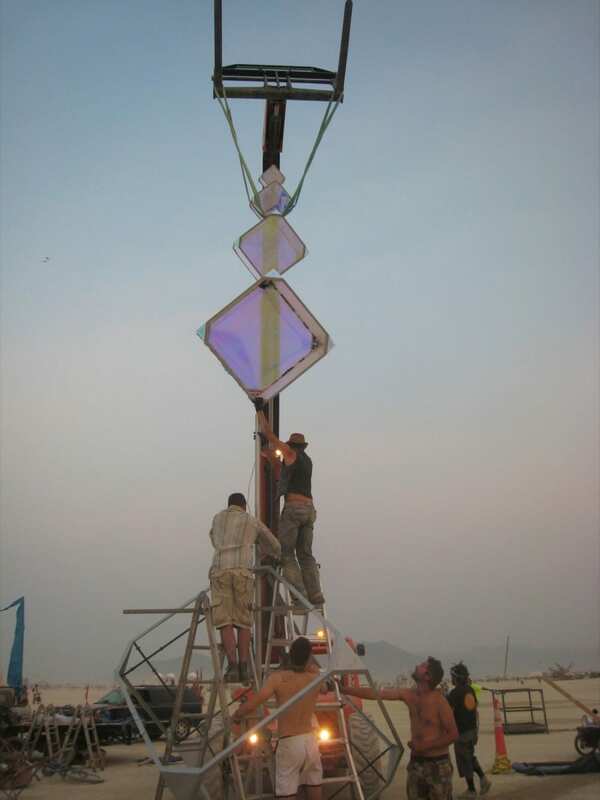 The 12 ft stack is lowered carefully onto the central pole to streamline the threading of the pole through the pre-wired cubes. 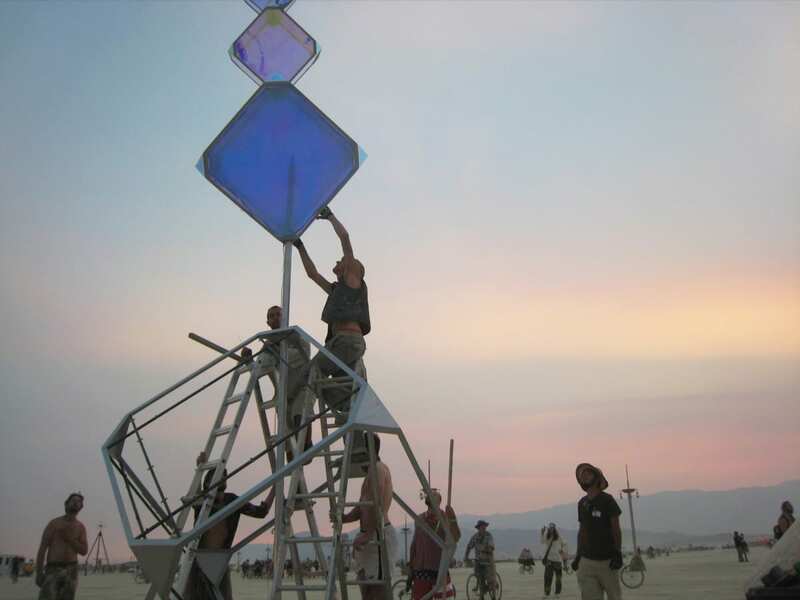 The sun has set and we have limited light by which to bolt and connect the wires to the base cube before total darkness sets in… we are challenged to work quickly as well as carefully. The webbing/straps have to be removed 17 feet high on the upper cubes; I go up, strapped to a basket in the forklift, to remove them. I remove them and check the orientation from above… bird’s eye view. Day 4: We maneuver the last face of the second cube into place with suction cups and special screws. A dust storm brews as we finish up. 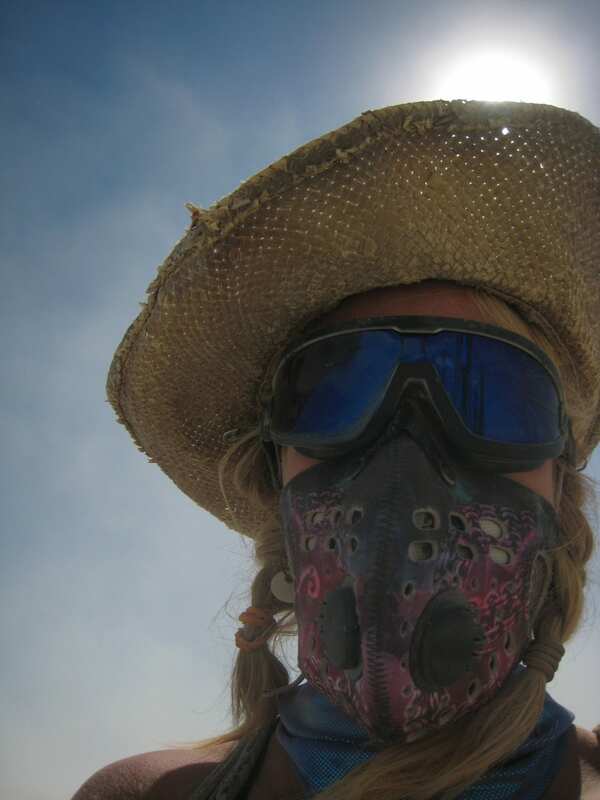 Building at Burning Man comes with significant challenges: the blazing sun, all wood chips and metal shavings must be collected (artists are expected to uphold the 100% ‘Leave No Trace’ ethos), workstations constructed/packed-down daily, power tools are charged on generators you must bring yourself, but the biggest obstacles are the frequent dust-storms. They can last for hours or a whole day, impair visibility as well as breathing; a dust-mask and goggles are essential. 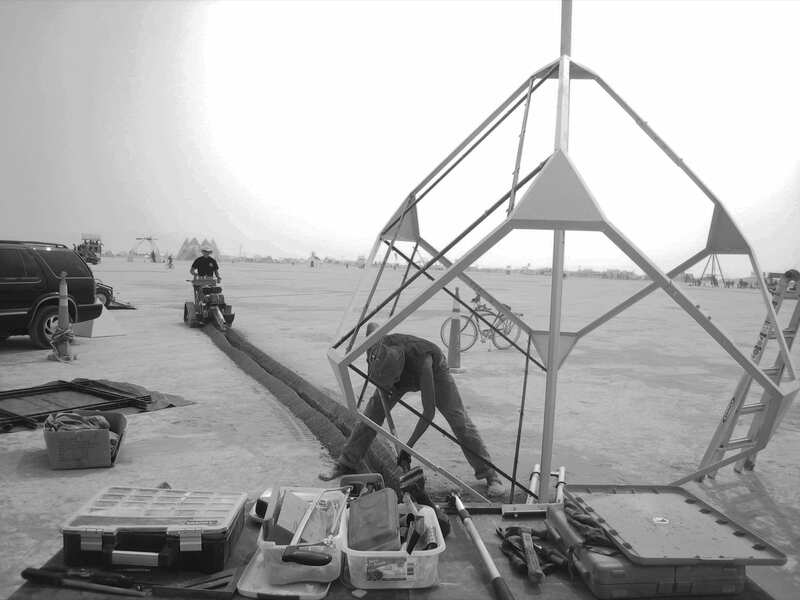 Once the dust subsides, we focus on paneling the base cube and finishing the wiring. 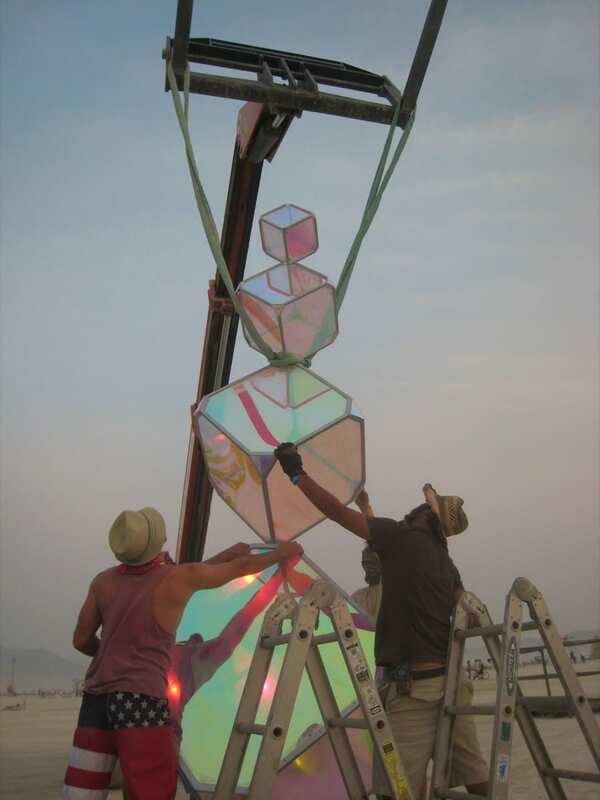 The iridescent acrylic only comes in 4 x 8 sheets, so for this reason and the sake of stability, the base cube faces are divided into 9 panels resting on steel grids. This phase requires 9 people working around the outside and inside simultaneously. The last panel gets laid in at 8:30 PM. 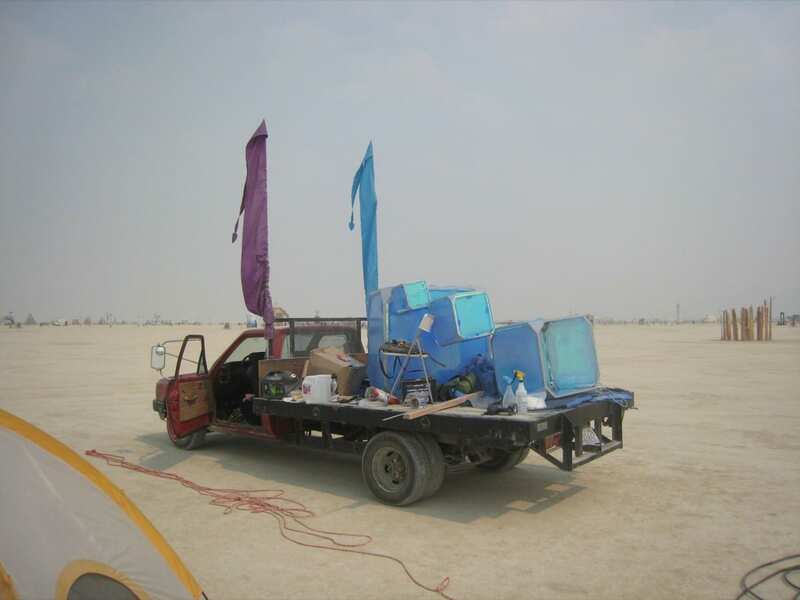 We’d considered many ways to place, but only in the last hour did one of our crew figure out a method that could really hold up in this harsh environment for a week. It required squeezing his upper body through a narrow gap with multiple sharp metal tabs to get the final nuts and bolts in; he works on/ in Boeing airplane wings, so he manages this seamlessly. 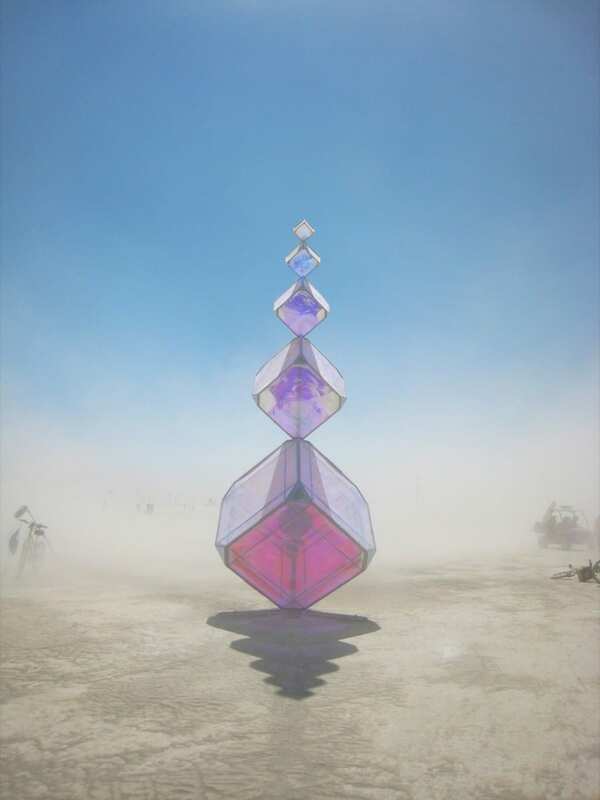  Archived in Uncategorized and tagged (In)Visible, Burning Man, Cubes, Installation, Issue 25, Kirsten Berg, Sculpture, Spectrum. Bookmark the permalink.